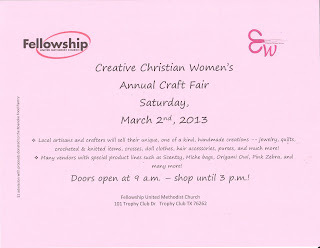 "Local artisans and crafters will sell their unique, one of a kind, handmade creations -- jewelry, quilts, crocheted & knitted items, crosses, doll clothes, hair accessories, purses, and much more! Many vendors with special product lines such as Scentsy, Miche bags, Origami Owl, Pink Zebra, and many more!" Located near the intersection of Hwy 114 and Trophy Club Drive, just minutes north of DFW Airport, south of Grapevine Lake and due east of the Texas Motor Speedway. Admission is a $1.00 donation, which will go to the Roanoke Food Bank. Booths/tables are 6 X 4 and cost $30. Additional tables/spots are $15. Chairs and electricity are provided. There will be a snack bar serving sodas, chips and hot dogs. Applications are available here and are due by February 15th, 2013 (extended deadline). For more information, contact their event coordinators, Michelle at 2mswilson@gmail.com or Lisa at 817-691-8749.